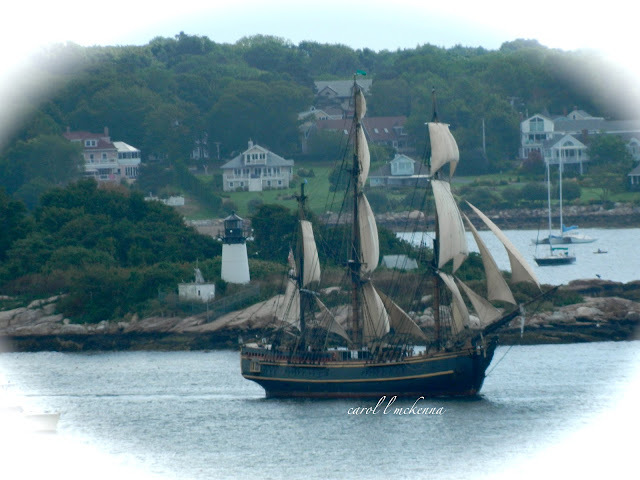 The photos above are all from the Schooner Festival that took place this past week on Cape Ann MA. It was a very special event. 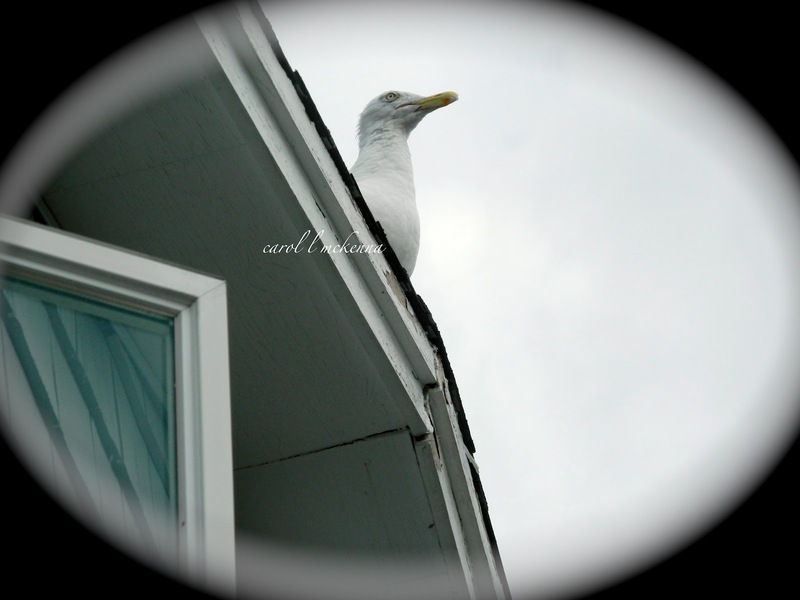 The photo above is our 'resident' seagull who came to view the festivities and is for Alphabe Thursday prompt the letter P.
Wishing you a fun and safe weekend. Looks like it was absolutely enchanting! Wish I had been there. Carol, wonderful photos! Does that sea gull ask for snacks? There are gulls on Jekyll that come to take snacks out of my hand. I love that!! Your oval framing really accents your photos! Lovely ships and sweet dog! Great shots of the Bounty, when it was here I got a few but there were a lot of other ships around it so they aren't so good. I would love to see such a festival. I love the looks of the old ships, but I've never seen one. I'm so glad you share. Your sea gull will have to pop over and meet some friends... I just know you had a wonderful time, those ships are amazing! That schooner festival looks like it would have been very fun...and how's that little art muse dog of yours? such a cutie! WOW I love your pictures!! Where do you live! Its such a beautiful place!! I love to see the 3 and 4 masted schooners. that would be fun to sail on one of those! I really enjoyed your wonderful pictures. It's lovely to visit with you from Rural Thursday. Amazing photos from this wonderful old ship. Gorgeous ! Beautiful boats - and very nicely photographed! 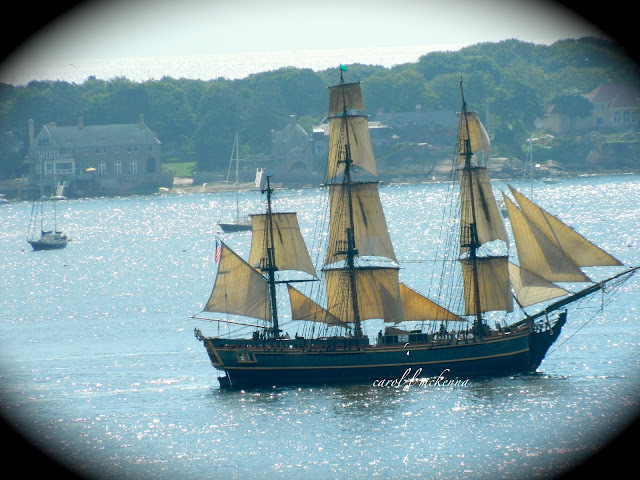 I love to watch tall ships! Great opportunity for you to take gorgeous photos. That gull pic is cool! You piqued My interest♫♪ A Schooner Festival sounds lovely....here in the midwest our town is gearing up for its annual Plowing Match!!! Farmers a challenged to furrow straight rows in vintage to newly manufactured tractors!! OH MY! What a fabulous thing to witness; I bet it was amazing! Simply beautiful including the bird!! Lobe your pictures - and the seagull was my favourite, too! I remember seeing something similar at Mystic many, many years ago. You can just feel the history emanating from those perfect pictures.